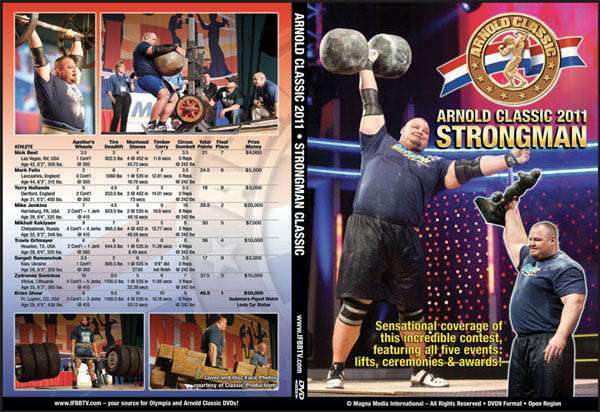 Every Strongman fan will want this DVD as it covers each intimidating apparatus and the champions’ skills in commanding its unique challenges with amazing determination and power. PREVIOUS YEARS OF THE ARNOLD CLASSIC STRONGMAN. 5. The Circus Dumbbell – Contestants will lift a replica of a “Circus” dumbbell, which were used by professional Strongmen from the early 20th century. The dumbbell weighs 202 lbs. and has a very big handle 3 inches in diameter. The men will use one hand at a time and lift the dumbbell overhead as many times as possible in 90 sec.